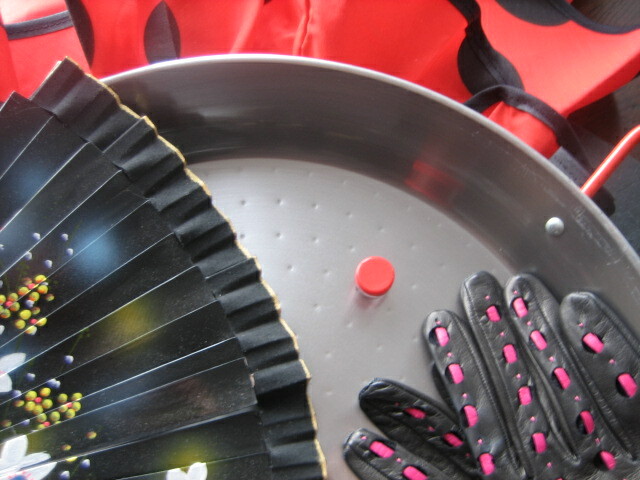 Olivia started it with a gift of a beautiful Spanish fan and a pair of fine leather Spanish gloves. A vial of Spanish saffron from Laura and Miguel with the promise of Miguel’s Paella recipe…. A red and black Spanish apron from Nancy and John with more polka-dots and ruffles than a Carmen Miranda movie! Seafood Paella was calling me. I bought a Paella pan and had a Paella Party. I found a recipe for Paella de Marisco de Tiet Joan*, and took some tips on paella from the internet. This recipe is an evolution of information, no two paella recipes are alike, “every family in Spain has a slightly different way to make paella.” So coupled with permission to use Paella de Marisco de Tiet Joan as a jumping off point—substitute ingredients and get creative—jump I did! Making paella is a very social endeavor. “The ritual of cooking is almost as important as sitting down and eating paella.” I wouldn’t bet on that! You can prep the seafood in advance and chop the vegetables, but you don’t want to start cooking until your guests start arriving and the wine starts flowing! Carried away with the fun…drinking wine, eating Spanish olives and Tortilla Espana (next week’s recipe), I forgot the asparagus and peas…garnish— but no one missed them. 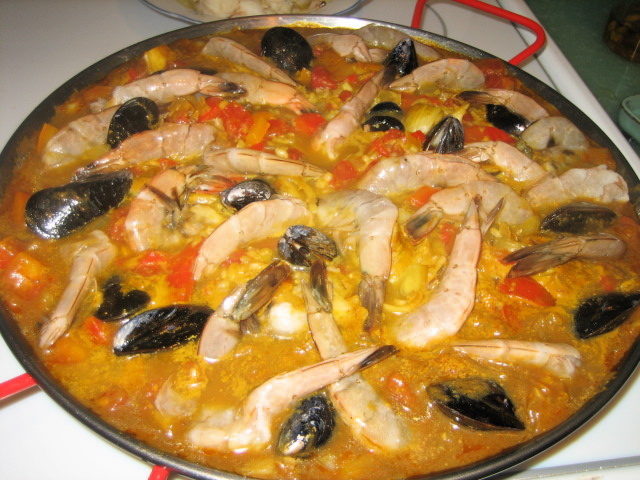 This Seafood Paella Ole recipe is for 4 servings. It disappeared! Paella is a “wonderfully versatile dish that allows you to substitute your favorite ingredients and to be creative with the final presentation.”* Paella is best cooked in a paella pan on top of a stove or grill and can be transferred to the oven once the broth has been added. 4 cups rice (I used short grain brown rice, but have heard Valencia, paella, Arborio, risotto rice, medium grain all work well or short grain. If it is the first time for your paella pan, wash it, then temper it before using. Heat the oil in the paella pan over med-high heat. 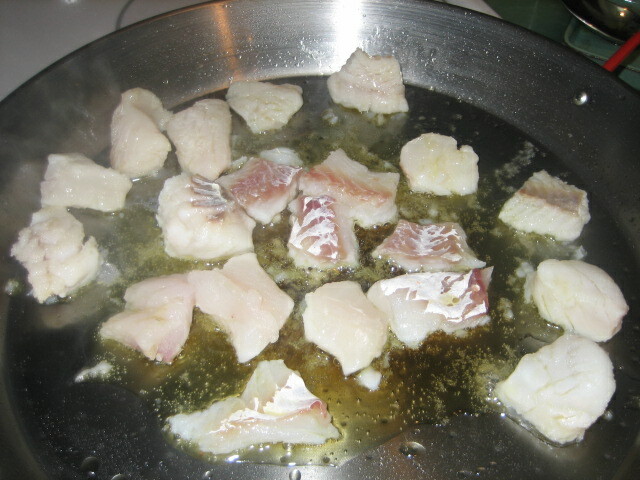 Add the cod and lightly brown on all sides. Remove the fish and put aside. Add the onions to the oil and stir fry until translucent, about 5 minutes. 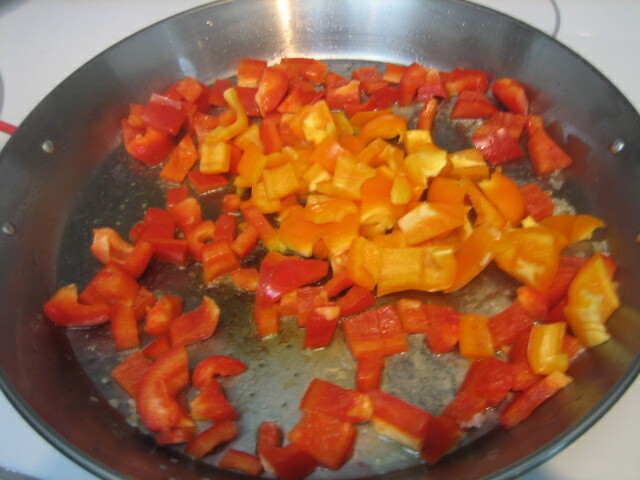 Add the peppers and cook for 3-4 minutes. 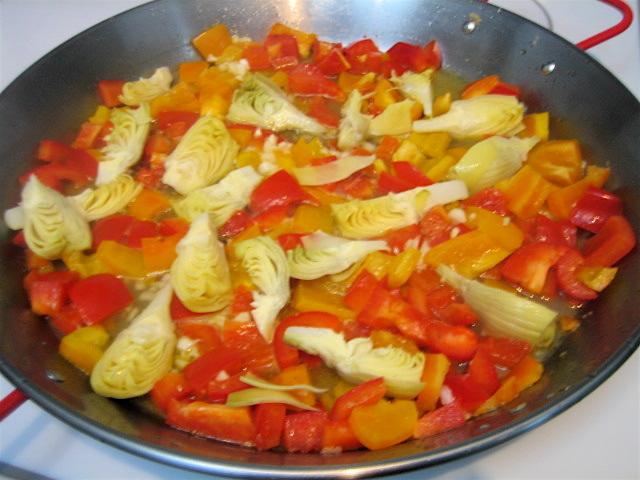 Add the artichokes, wine, tomatoes and garlic and let simmer for another 5 minutes. 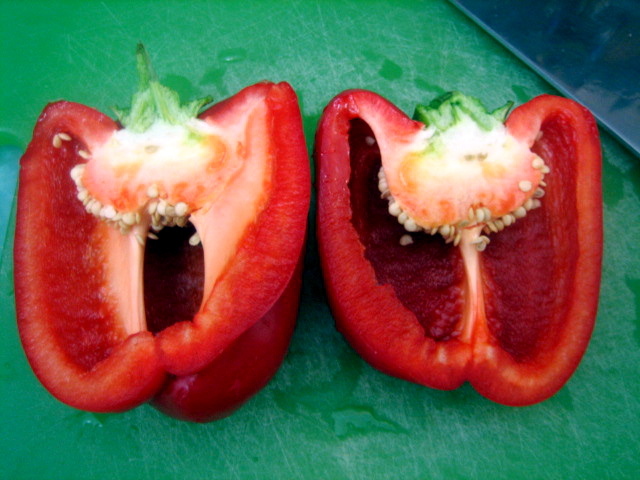 Pour in the rice and stir until the rice is thoroughly covered with the tomato-wine mixture. Add the saffron to the hot broth and stir. Slowly add the broth to the paella. Move the rice mixture around gently until it is evenly distributed throughout the pan. It is important to NOT stir the rice after this point. This is what makes paella distinct. 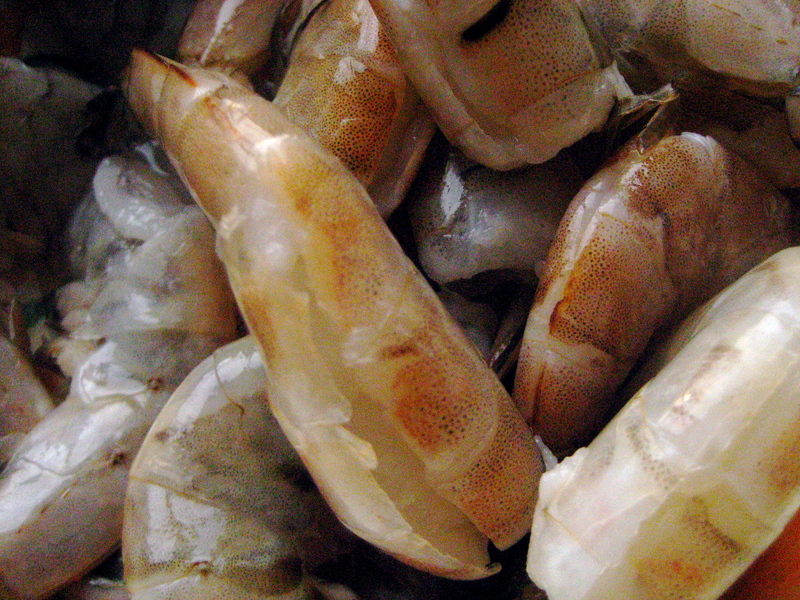 After about 10 minutes place the seafood into the mixture one by one, evenly distributing the seafood throughout. After another 10 minutes add the garnish. Once the water has been completely absorbed, approximately another 15 minutes, remove from heat, cover with foil and let sit for 10 minutes before serving. We never made the 10 minutes…aaah…maybe that’s why the rice was a little crunchy. But the good news is crunchy on the bottom is what you want! Place the paella in the middle of the table and serve directly from the paella pan. 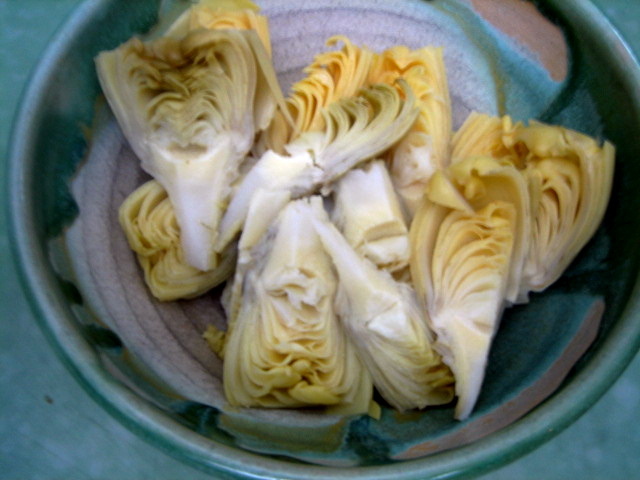 Serve with wedges of lemon. The lemons never made it either! 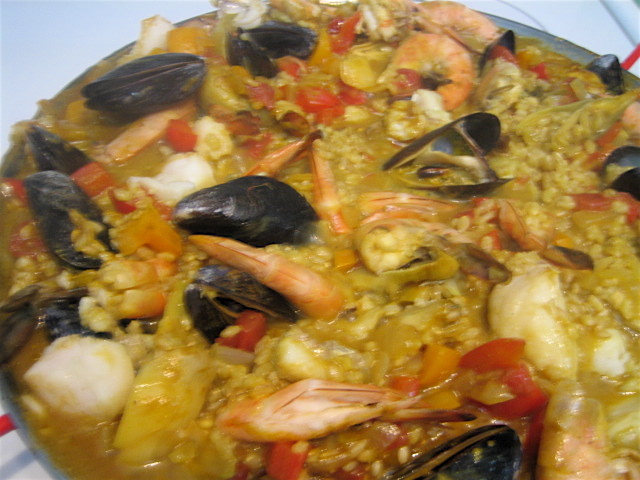 Tags: Fun, Healthy, Inspiration, Party, Photography, Recipes, Seafood, Seafood Paella. Bookmark the permalink. I thought all rice was crunchy..Hahah What a wonderful dish makes me want to head to Spain . LOL…You know crunchy rice! Travel, I thought it would make you want to cook! Yum, your photo’s are fantastic, looks like a great way to spend an evening! I agree with Polly…the food looks great and the photos are really good!! Hey! This looks delicious! I can’t wait to use these recipes when I have my new apartment! Love paella. This is such a yummy dish!